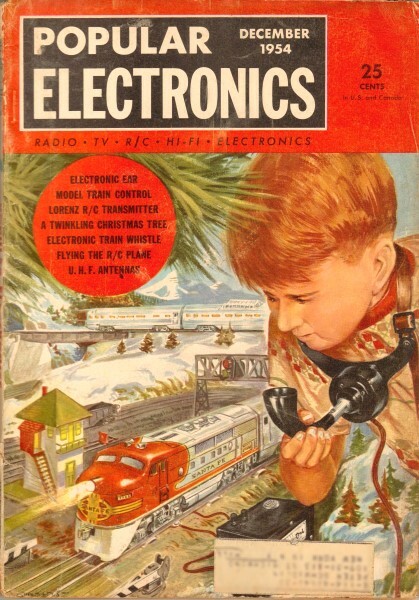 Maybe given the nature of newly published Popular Electronics, the editors decided using a big word like "nomograph" might be a little too out of the realm for use in a magazine seeking to appeal to newcomers to the electronics field. 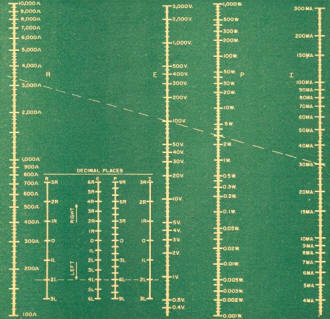 It is a little surprising since students of the day were quite accustomed to using this type of a graph since computers still filled entire rooms and hand-held calculators went by a different name - slide rules. 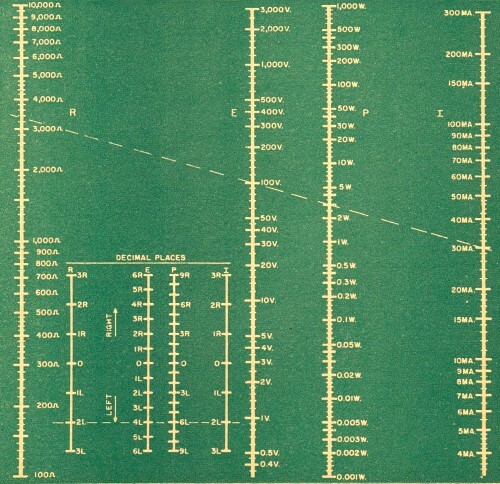 In fact, because of a familiarity with using a slide rule, people were more accustomed to having to shift decimal points to the left or right first to do the calculation on a device that only displayed values in a single decade range, and then to arrive at the final answer after the calculation. That is exactly the skill needed to use the nomograph. I guess that people today - even engineers - would have a harder time keeping track of powers of 10 than most reasonably skilled high school math students of the 1950s. IF YOU know any two of the four quantities. voltage (E), current (I), resistance, (R). and power (P), in a circuit, you can find the other two by using this chart. Using the upper part of the chart. just lay a straightedge between the graduations corresponding to the two quantities you know, then read the other two quantities where the straight­edge crosses the corresponding lines. For example, suppose the voltage is 100 volts and current is 30 milliamperes. The resistance is 3330 ohms (approximately) and the power is 3.0 walls. If the quantities you have are larger or smaller than any shown in the chart, you still can find your answer. Move the decimal point in each quantity to bring it within the range of the chart. In a power figure. move the decimal point a multiple of three places; in a voltage figure, a multiple of two places. In current and resistance, the decimal point can be moved any number of places. Then, using the lower part of the chart, lay your straightedge between the numbers corresponding to the number of places you must move the decimal point on the chart left or right to get the quantities you actually have. Read along the straightedge the number of places you will have to move the decimal point in each answer as given by the chart, to get the proper decimal point for your actual problem.